I seem to be on a bit of a Grenache kick lately. Who can blame me though, Grenache makes some lovely wines! I found this bottle lurking on my shelves and decided to give it a go. I’m also a club member at Quivira, so I’ve got at least another bottle of this hanging around from a club shipment. 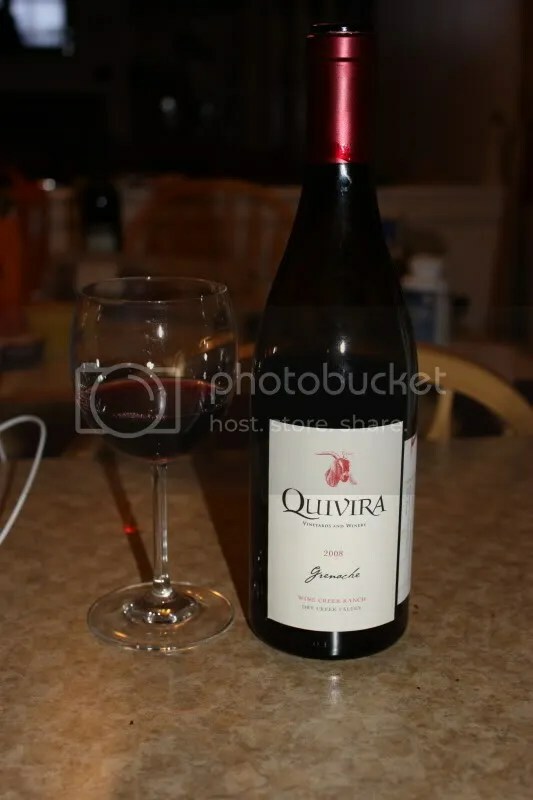 The wine in question is the 2008 Quivira Wine Creek Ranch Grenache. It clocked in at 14.8% alcohol by volume, had a real cork closure, and the 2009 (current vintage) retails for $26. On the nose I found sweet raspberry, cherry, cherry coke, spice, pepper, strawberry, and vanilla. In the mouth I got all the same red fruits as the nose along with some spice and a bit of oak. I think this wine could use some bottle age to really bring it around. I’ve had many other vintages of this wine and have always enjoyed those very much, though they have usually had a bit more time to age than this one. I’ve been diving back into my own wines lately. You would too if you saw the state my basement is in. It’s actually quite frightening as there are boxes everywhere, wine spilling out of them, and absolutely no room on the racks, even though I just bought another 112 bottle storage rack. 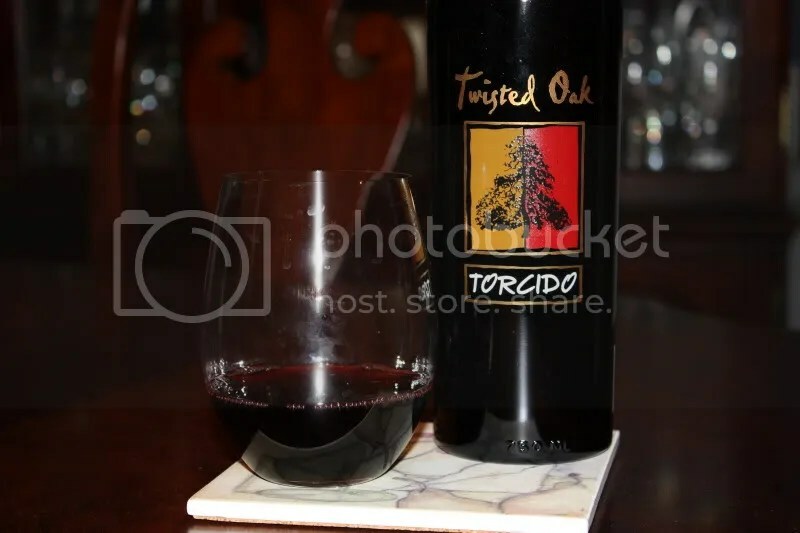 So this evening I pulled out the 2006 Twisted Oak Torcido. I got this in a club (I originally typed “cluck” here, I clearly have Twisted Oak rubber chickens on my mind) shipment who knows when. I’ve been a Twisted Few member for quite some time now! 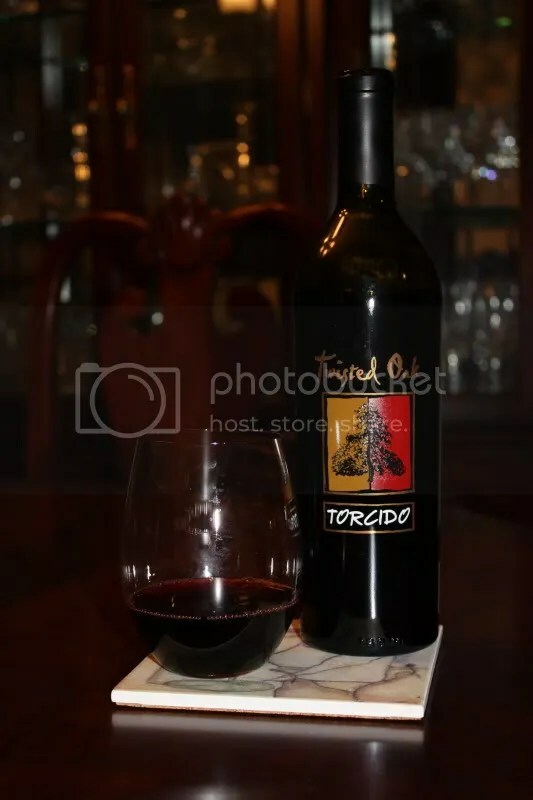 The Torcido is Grenache, clocks in at 14.5% alcohol by volume, has a real cork closure, and retails for…well, I don’t know, but the current (2008) vintage is $32. On the nose I got blackberry, black raspberry, spun sugar, slight toffee notes, some chocolate syrup notes, spice, and herbs. In the mouth I found raspberry, blackberry, some blue fruit notes, spice, and cloves. After sitting for some time in my cellar, I’m really digging what this wine has become. I think I’ve got another one or two tucked away and I’m excited to see what they taste like in the coming years. I’m sure you’ll read about it here! Disclaimer: I received this wine as a sample from Hahn Family Wines. Rejoice! Wine Blogging Wednesday is back! I missed it so. Though, admittedly, I totally missed the first reincarnation last month…having average about 4 hours of sleep a night and dealing with a fussy newborn, wine was not much happening! 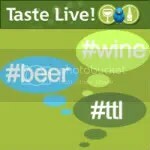 But I’m in for this month’s edition hosted by my friend Tim of Wine Cast. He’s chosen Rhones Not from the Rhone as this month’s theme. I must say, I am very partial to the Rhone varietals. Viognier, Grenache, Mourvedre, ets., are some of my very favorite wines. Oh, and Syrah! Who can forget a good Syrah. And some of the ones I love the most hail from outside the Rhone. A cool climate Syrah from CA is a lovely pleasure! 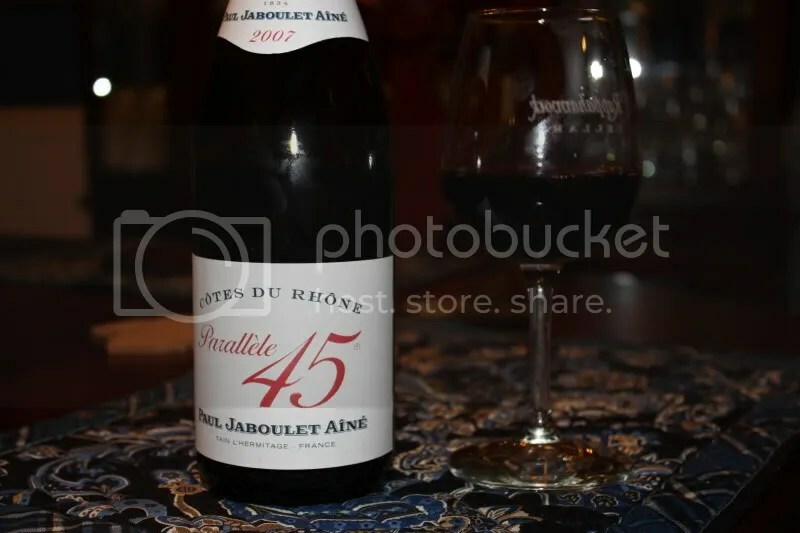 For this WBW, I chose a wine that represents 3 Rhone grapes. I know Tim asked us to look beyond the normal Grenache and Syrah, but with little spare time, this is my best effort these days. I think I get a disposition given I have an 11 week old. 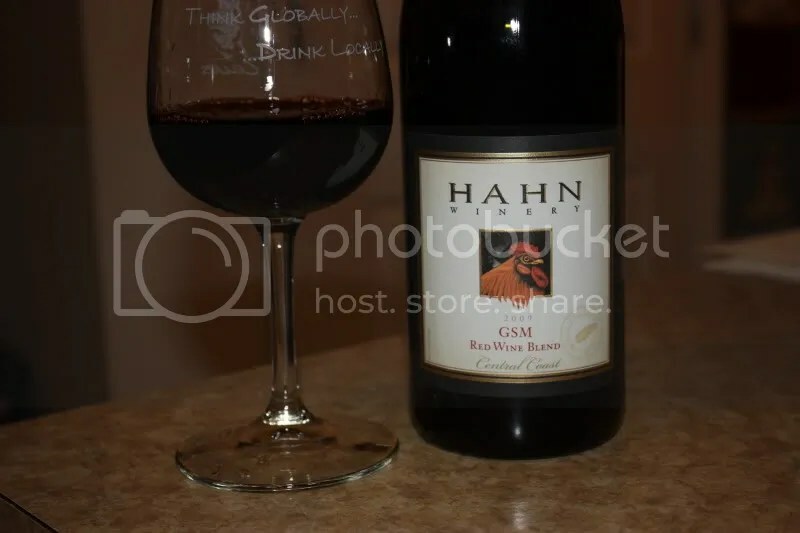 My wine is the 2009 Hahn GSM. Grenache, Syrah, Mourvedre. 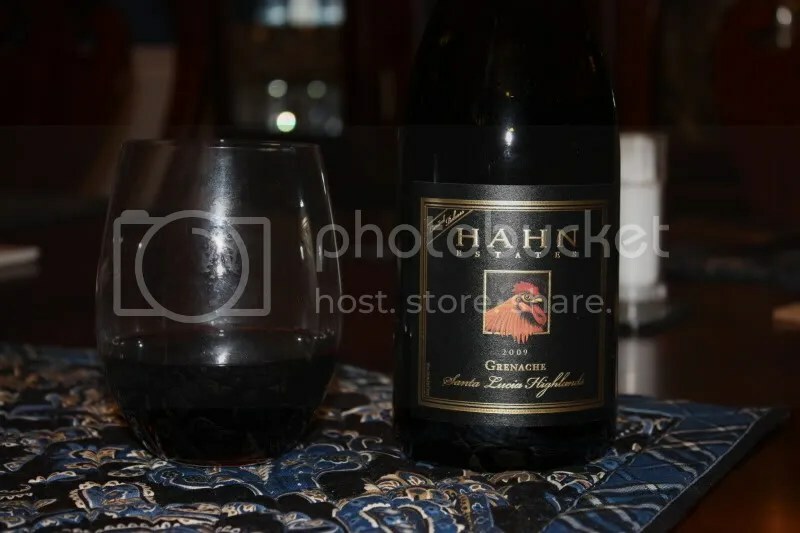 It’s composed of 60% Grenache, 37% Syrah, and 3% Mourvedre. Yum. It had a Diam closure and clocked in at 14% alcohol by volume. I’m not sure what it retails for as it was a pretty limited release from Hahn Family Wines and I believe it is sold out. 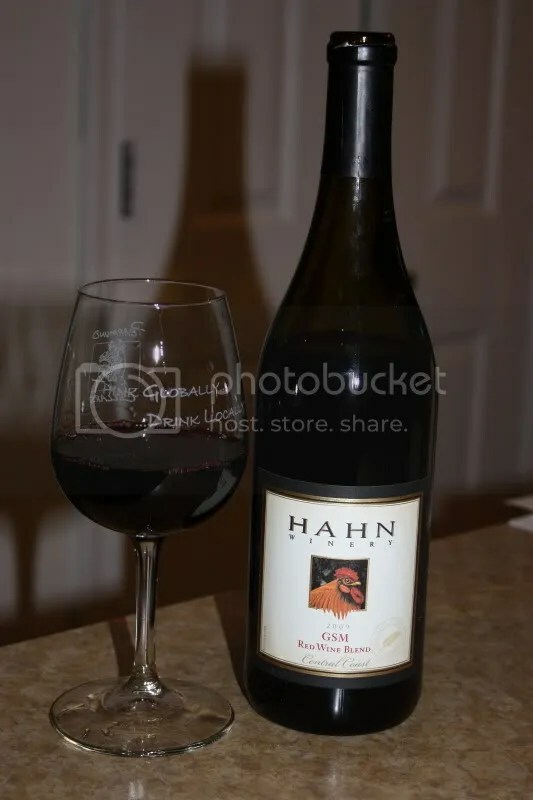 You should definitely keep an eye for the next vintage of this from Hahn. They were trying a few different wines this year, including a Grenache Blanc! On the nose I got strawberry, spice, cedar, baking spices, cinnamon, pepper, cherry, and bacon fat. I could really smell the influence of the Syrah on the nose of the wine, though the Grenache clearly also contributed. I think the Mourvedre showed up more on the palate. In the mouth I found strawberry, red cherry, spice, blackberry, black cherry, and earth. I found the wine to have nice acidity and structure with good tannins on the finish. Overall the fruit showed as juicy and fresh. I enjoyed this wine very much. Many thanks to Tim for hosting and I think I got my entry done in time! As always, a tip of the hat to Lenndevours, over at the New York Cork Report, our founding father. 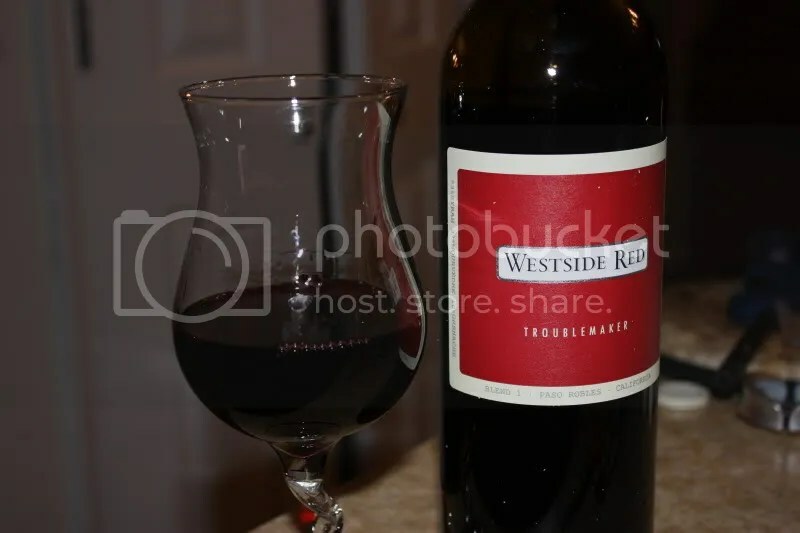 Produced by Hope Family Wine, the Westside Red Troublemaker is a blend of three vintages of wine, the 2007, 2008, and 2009. On first sniff I said “Syrah!,” and later upon examining the promotional materials that accompanied the wine I found that it is indeed dominated by Syrah, being a blend of 53% Syrah, 37% Mourvedre, and 10% Grenache. The wine hails from Paso Robles, clocked in at 14.5% alcohol by volume, had a real cork closure, and retails for $20. We enjoyed this with a steak, but I think I’d have it with my homemade pizza next time. On the nose I found plums, blackberries, black fruit, herbs, mint, pepper, chocolate, a meaty note (hi Syrah! ), and spice. In the mouth I got black cherry, plum, blackberries, spice, and pepper. 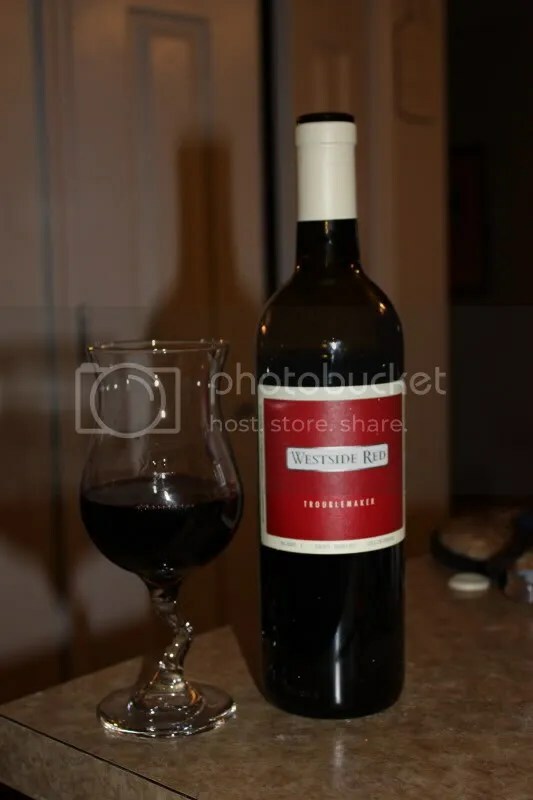 Overall I found the wine to be juicy with some tannins and nice acidity which is why I think it would do well up against a pizza with tomato sauce. I’m always looking for good pizza wines, and this one seems to fit the bill well with vibrant juicy fruits and enough spice to carry it through. Grenache is one of those grapes I wish people would pay more attention to, as it makes some wonderfully aromatic wines that I just adore. I know it’s scary to try new things 😉 but I urge everyone to go out this year and at least try a bottle of Grenache. Or a GSM (Grenache, Syrah Mourvedre) blend, the traditional place many people find the Grenache grape. Give it a go, it will be worth it. You could start here with the 2009 Hahn Grenache, a lovely little bottle of wine that we cracked open the other evening. 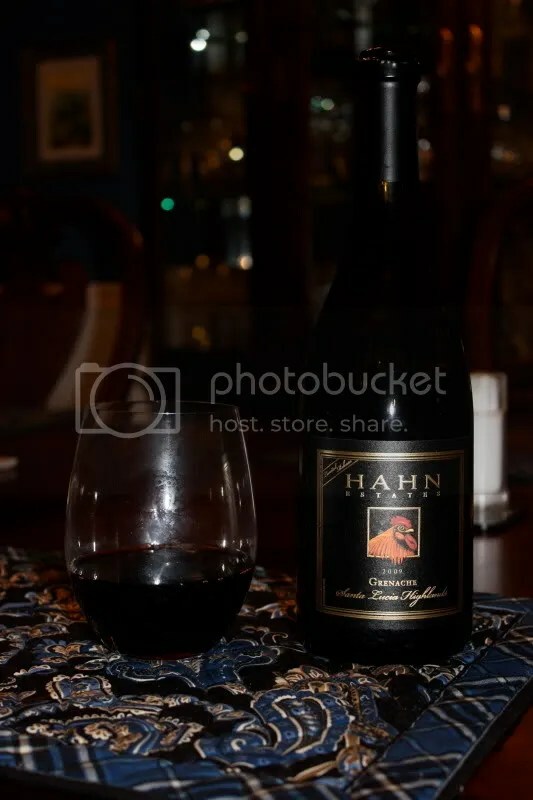 The 2009 Hahn clocked in at 14.5% alcohol by volume, hails from the Santa Lucia Highlands, had a Diam closure, and retails for…well, I’m not sure, but I’m guessing it’s in line with the other Hahn wines in the Grenache line, somewhere in the $12-$16 range. I know it was a fairly limited production wine, and it might be sold out, but keep an eye out for the 2010 if this one is gone. On the nose I got pomegranate, cherries, flowers, spice, white pepper, black cherry, vanilla, and cinnamon. Fantastic aromatic nose that just jumped out of the glass and made you want to jump into it. In the mouth I found black cherry, pepper, earth, blackberry, vanilla, and raspberry. Displaying tons of acidity and juicy fresh fruit, this wine and a roaring fire made for a very relaxing evening in the Wannabe Wino house. Disclaimer: I received this wine as a sample from F. Wildman. Strike that. This wine is not a typical GSM blend. It’s missing the M, the Mourvedre. 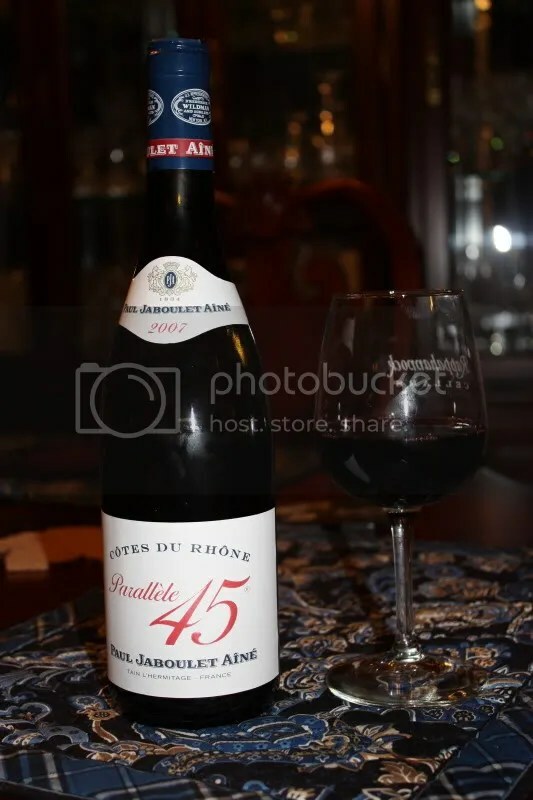 The 2007 Paul Jaboulet Aine Parallele 45 from the Cotes du Rhone is 60% Grenache and 40% Syrah. It had a real cork closure, clocked in at 14% alcohol by volume, and retails for about $10, though I see it floating around on sale for $9. For $9-$10 this is a great bargain wine. On the nose I got cherry, real tart bright red cherries, plum, raspberry, pepper, spice, and something that reminded me of a wood-burning fire in the fireplace. I was struck by how aromatic this glass of wine was. In the mouth I got the same fruits as the nose, though they also tended toward being a bit darker with black cherry and black plum floating around. 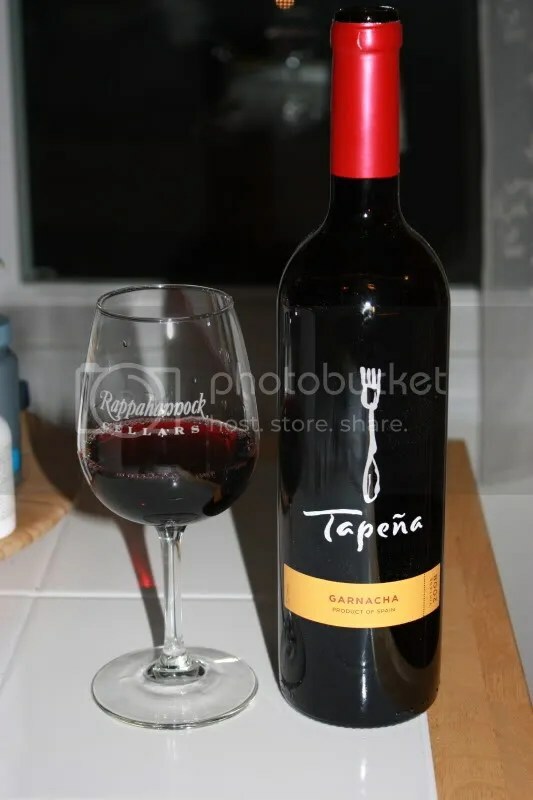 I also found spice and pepper and overall the fruit showed as tart and fresh with good acidity and tannins holding this little bottle of wine together. A definite buy at the price point.